So, you’re considering a scooter for your little one? Great idea! Scooters are not only fun for children, but they promote getting outdoors to exercise. Plus it’s beneficial for their mental development as well. Like a bike, learning how to ride a scooter will help develop their motor skills. Whether you already decided on buying a scooter or are just considering the idea, the following information will help. It will help you decide whether a scooter is a good fit for your child or not. So read on and first learn how to pick out the best scooter. Then read a list of reviews for the top 10 kid scooters on the market today. Okay, so it’s time to choose the best scooter for your child. But um… where do you begin? Don’t worry, we’ve broken down the selection process into six main categories. The categories are type, age & weight, deck, handlebars, braking, and price. Read on and learn specifically what to look for in each. Also, there are both the kick style scooters and battery operated scooters. All a kick style scooter means is you must push off the ground to ride it. That’s alternative to an electric scooter that drives with a button or throttle. Nine out of the ten scooters on this list are the kick type while one is electric. 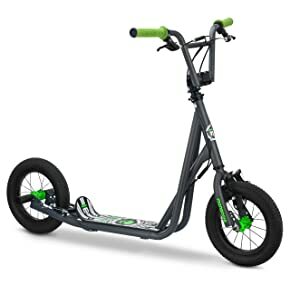 Generally, unless you are specifically looking for an electric scooter, you will want a kick style. A kick style is excellent for your child to advance their motor skills, get outside for fresh air and sun, and exercise. Similar to skateboarding, older kids may also want a scooter for doing tricks. Kick style scooters are the most common scooter. You simply push off the ground and glide until you slow down and then kick again. However, there are a few unique push/kick types where instead of pushing off you lean back and forth. It reminds me of the motion you use for skiing and snowboarding. 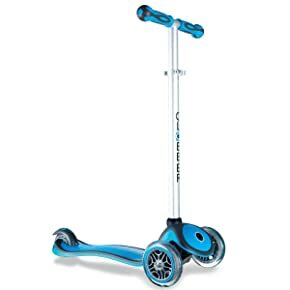 In my opinion, this type of scooter is more geared to the 6-9 age range. Either way, they are a whole lot of fun and can pick up speed quick. So, once you determine the best type, it’s essential to take a look at the age & weight specifications. 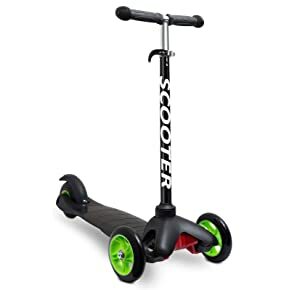 Another consideration is determining what age the scooter is designed for and the weight it can hold. Every scooter is built for a specific age range and can hold up to a particular weight. So be sure to review this before purchasing. For example, one scooter may be rated for 2-4 year old’s, and the other, 4-9. So let’s say your child is 2, then you know exactly which scooter to buy. However, let’s say your child is 4, then you need to make a decision based on how your child is developing. In regards to the weight capacity, it generally corresponds with age. But it’s worth a double check. Personally, one of my kids has always been much bigger for his age. So, although he fits into a particular age group, I would make sure to double check the weight capacity as well. A “deck” of a scooter is the part you stand on. Decks come in different sizes. The wider decks make it easier for your child to balance on. Younger riders ride much better on wider decks. The skinnier decks make the scooter lighter and provide more room to kick. Also, some decks, especially the ones for younger children, will taper. That means it’s wide in the front for balance but thinner in the back. Ultimately, the reduced width at the end of the deck leaves plenty of room to kick when riding. Also, make sure there’s some sort of grip on the deck for better footing. For example, the scooters built for tricks have a rough paper like a skateboard on the top. This will be convenient because it reduces the chances of their feet slipping off when riding or tricking. So check the deck and make sure it’s best for your child’s riding experience. Handlebars are the most basic as they all pretty much come in a T shape. But here’s the thing: most handlebars adjust, so make sure the one you buy does so with ease. When making height adjustments, determine how the bar unlocks and locks in place. Most have a quick release clip. Simply pull to unlatch, make the adjustment, and push the clip to lock it back in place. A quick latch makes adjusting the handlebar height easier as your child grows. It’s also convenient if you have two or more kids riding the same scooter. Also, some handlebars require a tool to make adjusts. When making adjustments need a tool, most of the time it will come in the box. Similar to when you buy furniture, there will be a hex key (Allen key) in the packet with the directions. Although this holds the handlebars more securely than the quick latch, it’s inconvenient. That’s because you must keep the hex key around to make adjustments over time. Personally, for younger children, I believe the rear fender brake is the best. That’s because it’s so simple to use. When riding, all they need to do is step on the rear fender. The fender then pushes against the wheel, and the scooter brakes instantly. In regards to hand brakes, they work similar to the brakes on a bike. Each brake handle connects to the handlebar of the scooter by the hand grips. So when your child wants to apply the brake, they simply grab the handle and grip their hand closed. And lastly, some scooters have no breaks, so keep an eye out. Like with any product, the price will range. On this list, you will see scooters as low as $20-$30 and as high as $100-$200. Mid-range is around $80. So find what’s in the budget for your family. Also, the different type of scooters has low-cost versions and high-cost versions. Naturally, the high-cost versions will last longer than the low-cost ones. Plus they usually provide a smoother ride and are designed to make riding easier and more convenient. I’ve noticed the cheaper three wheel version have problems with their center of gravity. This could cause the scooter to tip forward while riding. But kids typically adapt and get used to it after a few rides. So read the reviews and purchase what you think is best. If you are looking for a scooter that your child can ride until they get their driver licenses than this is the scooter for you. The Razor comes with adjustable handlebars so your child can raise them higher as they grow. Plus, it supports riders up to 220 lbs.! That’s because this thing is made to last. It’s built with a super strong aircraft grade aluminum t-tube (a complicated name for the handlebar post) and deck (the place you stand on). 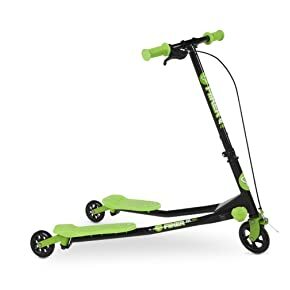 So basically, this can be your child’s first and last scooter. That’s why it’s one of the top-selling scooters on the market right now. Not to mention it’s available at an affordable price. A few other key features are the kickstand, rear fender brake, and foam grip handles. Its users love it for how it glides and provides an incredibly smooth ride. Pros- Super durable, large weight capacity, smooth ride, convenient braking system, no assembly required, easy to fold and carry. Cons- two-wheels and thin deck will probably be difficult to ride for small toddlers. 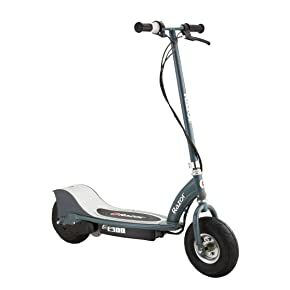 This scooter is the ultimate purchase if you have a young child and you are shopping on a budget. Sometimes, you don’t know if your child will like riding a scooter. So, instead of committing and putting out the extra cash, it may be better to grab the Den Haven Scooter for Kids. Spend little, see how well they catch on, then either keep it or if they really love it, buy them an upgrade over time. This scooter is a three wheel type which provides extra stability and safety. Yes, three wheels make it easy to ride, but it’s also safer because it prevents your child from falling from losing their balance. The t-style handlebars lock in place with a quick latch. It’s literally as easy as unlatching, moving the bar up or down, and pushing the lock in place–nice and easy. Now, remember, this is a low-cost option so don’t expect the best scooter on the market. You get what you pay for, but it does come with what they call a “high-quality aluminum frame.” What this means for your young child is they can easily maneuver it because it’s lightweight. It also has a rear fender brake on the back wheel. To stop all your child needs to do is stand on the fender. It users love it for its low-cost! Pros- Low cost, three wheel design makes it easy to ride, quick latch handlebar adjustment, convenient rear braking system. Cons- Only two colors available: pink and black, taller children have reported falling over the front due to a slightly off-center of gravity. The Radio Flyer My First Scooter, is just that, a scooter built for a first-time rider at a young age. That’s why I rate it as the best choice for two year olds. I have a two year old myself, and when reviewing it, I couldn’t help but visualize the smile on his face if he were to ride it. It’s big and red. Reminds me a fisher price style toy. The deck benefits the little ones also. Not only does it have an extra-wide base which provides maximum stability, but it tapers backward. This provides a clear kick path. It’s lightweight too. The weight capacity is 50-pounds so there’s not much extra weight needed to keep it sturdy. I couldn’t imagine your 2-year old having trouble moving it around. This scooter is also designed for safety. For example, the wide turning radius is specifically designed to prevent tip-overs. Its buyers say their kids have no trouble trying to ride it for the first one. It seems their kids catch on quick. Pros- Lightweight, low-cost, a safe turning radius, wide base, three wheels for stability, easy-rear braking system. Cons- Rated only for 2-4 year-olds. Looking for your child’s first scooter? Then the Micro Mini Deluxe Kick Scooter may be your best bet. What you notice first about this scooter is its three-wheel design. That means two wheels in the front and one wheel in the back. As you can imagine, this makes it easy to ride for younger children. That’s because unlike a 2-wheel scooter, they will not be required to balance themselves. It’s rated for children ages 2-5 and has a weight capacity of 75 lbs. What also stands out about this scooter is its color options. 11 colors total to be exact: apricot, aqua, blue, green, lavender, ocean blue, orange, pink, purple, red, and yellow. A few other features to note is its adjustable T-bar and fiberglass flexible deck. Its users love it for its three-wheel design for quick learning. Pros- three wheels make it easy to learn how to ride, multiple color options, durable frame, non-slip deck. Cons- must use provided hex key to tighten handle-clamp, limited age, and weight limit. Learning to ride a scooter can be challenging. As adults, we don’t always see it as such because like a bike, it’s something we learned a long time ago. But the truth is, learning how to ride a scooter is a new and sometimes hard challenge for your child. Fortunately with the Glover Primo 3 Wheel Adjustable Height Scooter, it makes the challenge a bit easier. This three-wheel scooter comes with what they call a “secure lock button.” The lock button keeps the scooter riding in a straight line. Basically, it helps the rider keep their balance. Then when your child is ready, simply unlock the button, and your child can learn how to turn. It’s a step by step approach to riding a scooter and helps prevent the rider from falling over. Its users praise it for its quality and adjustable handlebars. They also like the many color options to choose from. 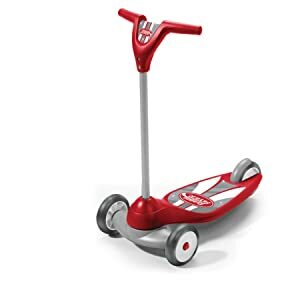 This scooter is recommended for ages 2 – 6 years and has a maximum weight capacity of 110 lbs. Pros- Multiple color options, secure lock, three wheels for balance. Cons- Only made from 2-6 years old so your child will eventually outgrow it. When I first reviewed the Micro Maxi Deluxe Kick Scooter, I noticed it’s higher than average price. So naturally, I looked into finding a reason why. It’s a three-wheel kick scooter, but why the high cost? Then I realized, first, it’s rated for kids ages 5-12 and because it’s three wheels, your five years old can start riding right away. So, if you buy it for your child at five years old, they will get seven years out of it. Not a bad deal. That equates to approximately $20 per year or $1.60 per month. Then looking into it further, I realized it’s not your average scooter. It also comes with a smooth-gliding Maxi Deluxe. All that means is similar to a skateboard, it provides curving and carving action. But please REMEMBER– you must tighten the handlebar clamp before riding, if not the bars will slide down. Some users miss this and have reported thinking they bought a defective scooter. Only realizing they forgot to tighten the handlebars. This scooter also provides one of the smoothest and quietest rides on the market. Plus it holds riders up to 150lbs. I think best of all its build strong, durable, flexible, and lightweight. That’s the sort of combination you get when you pay higher prices. Its users praise this scooter for how safe they feel while riding it. Pros- High quality with a durable and robust frame, easy to ride, curving action, multiple color options, wide age range, super smooth gliding. Cons- high price, your child may outgrow the three wheel style. This Scooter is probably the most unique one on the list. The Yvolution Fliker Air A1 Push Swing Scooter is a three wheel scooter: one wheel in the front and two wheels in the back. Now here’s where its uniqueness comes in. Instead of pushing off the ground the rider moves their hips and legs from side to side to ride. You ride by carving and drifting. It seems kids around the ages of 6-9 love it the most. It’s made for kids five years old or older and can hold a max weight of 110lbs. Its users love it for it’s the fun way to ride by curving from side to side. Pros- Unique carving action to move scooter, three wheels for easy balance, handbrake for quick stopping. Cons- Some assembly involved, limited color options. If you’re going to buy an electric scooter for your child, then the Razor E300 Electric Scooter is your best bet. I say this because it’s made by Razor which is one of the leading scooter companies in the world. As you probably already know, it’s best to buy electrical products from a reputable company. This electric scooter, in particular, rides up to 15 miles per hour and does so quietly. The motor is quiet, mainly because it’s electric. But remember- an electric scooter won’t last forever. This scooter will ride up to 40 minutes continuously until its next charge. When it’s time to charge simply plug it into the wall like a cellphone. Nice and easy. There’s even a kickstand to sit it upwards while charging. Also, when riding, there’s a hand operated brake so your child can pick up speed with confidence knowing they have a quick and effective brake system to stop. The braking system will put you at ease also. Another key feature is the pneumatic tires. Air filled tires provide better balance and control as well as a more comfortable ride. Its users praise it for its smooth and quiet ride. Pros- 90-day manufacturer warranty, smooth ride, quiet motor, electric powered, made by a reputable brand, built for all ages. Cons- some assembly required, electric so no exercise for your child. 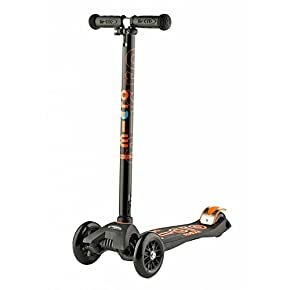 If you have a child that wants a scooter for doing tricks, jumps, and spins, then the Fuzion Z300 Pro Scooter Complete is one of the better choices. You get a wider set of handlebars and grip paper on the deck (like a skateboard) to make tricks easier to learn. 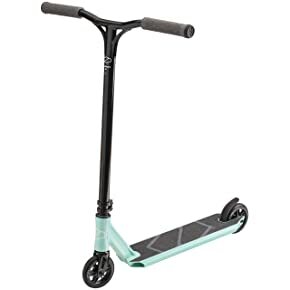 It’s designed for an entry-level to intermediate scooter rider and is built extremely durable. It’s without a doubt one of the toughest and lightest decks on the market. Yes, this scooter is built to do tricks, but there is a safety braking feature as well. Like most scooters, there’s a rear wheel fender style brake. Simply step on the rear wheel fender, and the scooter will brake immediately. Its users love how long the grips are because they make it easier to grab onto after a trick. Pros- Extra wide handlebars for easy tricks, alloy core wheels keeps right lightweight, rear fender brake, super smooth ride, superb customer service. If you know anything about BMX riding then you’ve probably heard of the company Mongoose. Well, allow me to introduce the Mongoose Expo Scooter with 12” Wheels. At first glance, you may mistake this scooter for a bike. But then you’ll notice it has a deck instead of pedals. However, it has many features like a bike. Front and rear brakes, pneumatic tires, spoke rims, pegs, and a 360-degree brake rotor. It’s perfect for speed, comfort, and to use for riding off ramps. 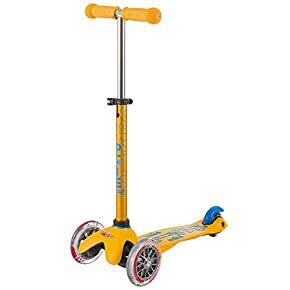 If your kid wants to ride off-road and/or perform tricks off ramps, then this is the scooter for them. Its users love it for its wide deck and smooth ride. 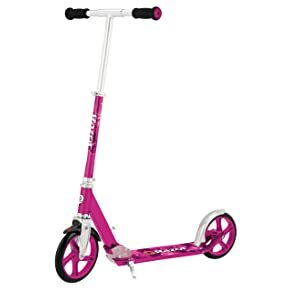 Pros- Large wheel creates a smooth ride, comes with pegs for tricks or so a friend can ride on the back, picks up speed fast, able to ride off-road. Cons- Hard to ride for younger children, bulky. So there you have it. You received a crash course on scooters. You learned how to pick out the best scooter for your child. And you reviewed a list of the top 10 scooters on the market today. So now, simply pick one out, ship it to your house, and watch your child’s face light up when they ride it for the first time.